Many people enjoy growing jade plants at home because they are easy to care for and lovely to look at. What many people do not know is that starting a jade plant from a stem or leaf cutting is almost as easy as caring for jade plants. Below you will find the steps for how to root jade plant cuttings and leaves. Growing jade plants from cuttings starts with taking the cutting. Select a branch on the jade plant that is healthy and free from disease. The branch should be 3 to 4 inches long for rooting a jade plant. If there is not a branch that long on the jade plant, you may want to try the directions for propagating jade plants from leaves (which is lower in this article). Use a sharp, clean knife to cut the selected branch off the plant. The next step for starting a jade plant from a cutting is to allow the cutting to dry. The wound on the jade plant cutting you have taken will be wet and will invite disease if you try to root it wet. 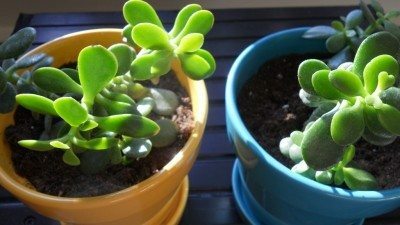 Allow the jade plant cutting to rest in a dry, preferably warm, spot until a callous develops (about one to two weeks). In order to further make sure that disease does not infect the jade plant cutting, you can dust the open wound with rooting hormone, which will also contain an anti-fungal compound. Once the cut on the jade plant cutting has dried, place the cutting into a potting mixture made of half vermiculite or perlite and half soil. When rooting a jade plant, water sparingly so that the potting mixture is only damp until the jade plant cutting takes root. After it has rooted, you can treat it as you would a normal jade plant. If the jade plant is small or if you are only able to harvest a few leaves from the plant, you can still propagate jade plants with only the leaves. When starting a jade plant from a leaf, start by selecting a healthy leaf from the plant. Snip the leaf from the plant. The next step in propagating jade plants from leaves is to lay the jade leaf onto a potting mixture of half vermiculite or perlite and half soil. Water the potting mixture once after you lay the jade leaf down and water sparingly until the leaf puts out roots. Once the leaf has taken root, the leaf will start to grow plantlets, or tiny plants, from the edges of the leaf that touch the soil. 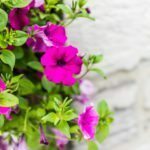 It should take anywhere from two weeks to two months for plantlets to appear. Once the plantlets are a few inches tall, you can treat them as normal jade plants. Growing jade plants from cuttings or leaves is easy to do. 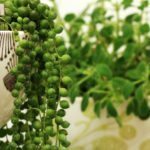 Knowing how to root jade plant cuttings and leaves can help you to make more plants for friends and family. Good luck with starting a jade plant in your garden. Read more articles about Jade Plants.